Hey you, Mr. New York Times reporter. Hey you, Mr. Talk Radio Show Host and guests with “inside” knowledge. Hey you, Mr. ESPN college football “reporter.” Hey you, Mr. Bama fan conspiracy theorist message board poster. The following is for you. All of you. That’s right—despite everything you’ve heard and been told just relentlessly ever since late last season, Auburn has been cleared. 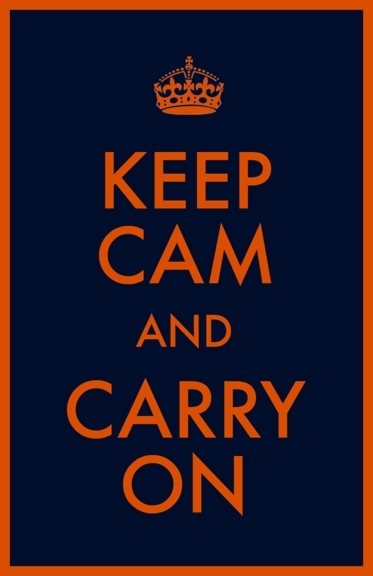 As surely every Auburn man, woman and child knows by now, the word came down from on high (ie the NCAA) on Wednesday that Auburn has been cleared of any violations in the Cam Newton investigation. Understand this very clearly: The NCAA crawled all up inside Auburn’s athletic department and lived there for a year and they couldn’t find a single thing. And they were looking hard. Oh, were they looking. After all the headlines and hoopla last fall about Cam… After the ocean of stories and columns and speeches on talk radio about how college football is corrupt and something must be done… After all that, the NCAA Enforcement staff got serious, and started hitting schools right and left. Georgia Tech? Who even knew they were under investigation? Nailed. LSU? Nailed. Ohio State – nailed and nailed and nailed again. Ouch. South Carolina? Nailed. Oregon? Under investigation. Boise State? Nailed (for stuff the tennis team did). Oh, and Auburn? Surely they nailed us for something, right? There was so much talk—so much smoke! So…where’s the fire? Let’s review the roll call of “bombs” that went dud in the last year, shall we? – “The Bingo Trial and FBI Tapes.” Result: nothing. No mention of Auburn or even of college football. – “NCAA Investigation of Cam including tax files and financial records from the Church.” Result: nothing. – “HBO Four Allegations.” Result: nothing. – “The bank” theories. Result: nothing. – “Danny Sheridan/Bagman Allegation.” Result: nothing (other than Sheridan and Finebaum looking like bigger fools than normal). – “Radio show claims it has tapes of Cam accepting benefits.” Result: nothing (and the person making the allegation got fired). Auburn was tried and declared guilty in the court of public opinion based on this evidence: Someone with connections to Mississippi State tried to offer his dad money to get Cam to go to MSU (or maybe his dad asked someone at Miss State about money). That’s it. That’s all there ever was. And many, many “journalists” in this country have dragged Auburn through the mud every day since the story first came out. Auburn people like us aren’t surprised that nothing was found on Cam. But we have to say we were surprised that the NCAA looked as hard as it could at Auburn and found nothing. Nada. Zilch. And they wanted to get Auburn so badly—after the embarrassing talk of corruption last fall, the NCAA wanted to nail Auburn as badly as any school they have ever investigated. The chorus of “Cam and Auburn are guilty” was loud and long. We will not be satisfied if the NCAA announcement of exoneration is printed in the fine print at the bottom of a few websites and then goes away. This story needs to be told – a young man, his family and a university were tried in the media – unjustly. The desire to draw page views and readers led to piling on and some of the worst sports journalism in American history. The NCAA must have come to recognize this. Their announcement on Wednesday, clearing Auburn of any wrongdoing in the matter, was virtually unprecedented. Usually they don’t ever say they’re done sniffing around. This time, not only did they announce it, they used the opportunity to denounce those who have been throwing around unsupported allegations. Auburn won the National Championship in 2010. And yet, the next morning, instead of being able to turn on the car radio and enjoy the talk about it, what did any of us hear but, “Well, mark this one with an asterisk, because it’s only a matter of time until the NCAA takes it away.” Wrong again, ESPN! And Kirk Herbstreit helpfully informed us, via the Finebaum show on Wednesday, that Auburn fans could now celebrate their National Championship. Well, gosh, Kirk—we appreciate the permission. But, to be honest, we have to tell you—we’ve been celebrating the national title every day since January 10. Related: Where there’s smoke, there’s smoke. Click here to help us keep the lights on and the obsession with Auburn lore unhealthy. What about Ohio State? Is it not official yet? Preach it. And props to our AD and compliance department. Saying Auburn is innocent of any wrongdoing is about like saying Casey Anthony and OJ Simpson were innocent…oh wait.. I should be clear – that is not the list of who is under sanctions now – but who is on probation as part of their sanctions. Some schools got punished but probation was not part of it. nice take on the chive logo. Please read the column again– not that you did the first time. Please tell me bob really just didn’t TRY and compare the NCAA and a criminal court. Poor guy. Was anyone from AU actually surprised by this? The whole sordid fiasco says more about the sorry state of “sports journalism” (I use that term loosely) and the insane level college sports now occupies in the psyche of the general public – especially those who never went to ANY college much less the subjects of their undying idolatry – than anything to do with Auburn University. It also gives more credence to the term “drive-by media”. Once again ‘journalists’, formerly respected news organizations and every moronic blogger with a keyboard (one has to go back to Lancelot Link’s piano player to see a more ineffective use of a keyboard) throw whatever they want out for public consumption yet take no responsibility for the reputations they destroy and the messes they create. Oh well…we were wrong…on to the next story. Frankly this isn’t going to end until ‘adults’ quit using the successes of kids playing a game to make up for their own lack of self-worth. Call me Deacon Blues baby…. Van P in Illinios, give them a break because they probably had to get a nonbamer friend to read it to them and respond for them. You can’t expect much intellect or reasoning skills from these bamer fans. Some of these people will never ever ever believe it because their jealousy and hatred is what drives the “belief perseverance” Look it up– you believe what you want to believe despite the evidence. Not one of these jerks would stand for being slandered and berated for something someone THINKS another person MIGHT know. (Cam knowing what his dad did—- ) ESPN has lost my respect forever- even now, it is being reported with such a bias– “Auburn cleared of MAJOR violations dot dot dot FOR NOW dot dot dot” I dont respect the majority of my fellow SEC fans at Bama, UGA ,Fla, or Miss State… and Im not sure I ever will again. tennessee and lsu are on probation right now, south carolina is about to be on Dec. 24. I’m not surprised, either by the NCAA’s announcement or the continued denial that Auburn did nothing wrong by its haters. The latter have been hanging onto speculation and rumors for a year now. Facts were never a part of their case against Auburn so the fact the NCAA found no evidence of wrongdoing after a 13-month investigation will hardly deter them from continuing to make fools of themselves. As the NCAA said, “As such, any allegations of major rules violations must meet a burden of proof, which is a higher standard than rampant public speculation online and in the media.” Some have standards, some don’t. Penelope B I couldn’t agree with you more. I could only shake my head at some of the comments I heard today from fans of other schools. In their minds you are what they want you to be. We have been celebrating since Wes ran onto the field to kick it through the uprights for all the Tostitos! It’s not “Alabama, it’s the “University of Alabama-Tuscaloosa” according to the NCAA report on their current probation. Also, IIRC, they have 16 teams currently on probation and that must be an NCAA record. Don’t tell ’em or thay will start claiming yet another fabricated national championship. Alabama on probation. yep we sure are……For having too many textbooks! WOW!! thats an advantage for graduation,and hurts othter sissy football teams who dont graduate their players. Alabama was second only to standford in academia. Your textbook was wrong. It’s Stanford, not Standford. This pure nonsense, Alabama in not on probation! May be on Academic probation as is Auburn but who cares? All that matters is are they Bowl Eligible And they are! Putting Penn state on Bowl Probation for 4 years is just wrong! did in the past is just outragious!